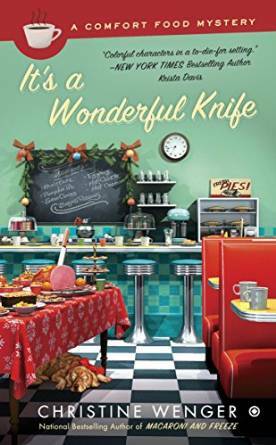 “It’s a wonderful time of year”… until murder strikes in the latest Comfort Food Mystery. But first it’s off to the hospital for Trixie Matkowski after a tumble down the stairs. Taking her there is, Trixie’s BFF, Antoinette Chloe Brown, who drives “like the road is a giant pinball machine.” Unfortunately, Trixie has broken her leg just as the busiest time of the year is about to begin for her and her business, the Silver Bullet Diner. Through all of the drama in the early pages—during Trixie’s trip to the hospital and getting settled into recuperation mode at the Big House, her large Victorian home in Sandy Hook—there’s mention of some trouble brewing at the local church. Margie Grace, the long-time “director” of the Christmas pageant, has been ousted and she’s not happy about being replaced. She even stirs up trouble by staring a rumor that a Hollywood talent agent is likely to attend. During the auditions, the new pageant director (and church secretary) Liz Fellows get in a spat with Margie. Stage moms and dads get a little rowdy, and Deputy Ty Brisco tries to maintain a semblance of order. So it’s no surprise that Trixie—on hand catering the event—discovers Liz dead. The woman was literally knifed in the back! Trixie tells us that “Ty would order me to mind my own business and leave the investigating to him, a trained professional.” She notes that he works “within the confines of his job.” Something she and ACB have no such problem with. Naturally, hijinks ensue as Trixie and ACB break all sorts of rules investigating the murder. They take Liz’s purse and laptop to search them for clues. And they break into Liz’s house in the hunt for a missing flash drive. Too bad someone already beat them to it! Ty actually arrests them for the break-in, hoping to impress upon them the folly of their ways. The point doesn’t quite get across. Trixie (with ACB’s help) later breaks into the apartments of two other suspects. In spite of such unorthodox methods, Trixie turns up several important details. Liz had files with references to Buff and Bing. Phone messages suggest the church was having money troubles, and there’s a whole lot of pull tabs that just might incriminate someone with a gambling addiction. It all comes to a head at the Christmas pageant when Trixie finds a crucial piece of evidence and confronts the killer backstage. A moment when her crutches come in quite handy. It’s a Wonderful Knife wasn’t quite what I expected. With Trixie’s injury, I was anticipating a more Rear Window-esque story, but Trixie was far more active than she probably should be considering her leg was in a cast. As usual, she overextends herself. In addition to running the Silver Bullet, catering events, and decorating for the season, Trixie also volunteers to run the pageant and fill in as secretary at the church. At least this time, however, she has a lot of help (allowing her ample time to sleuth). Tying into the story’s feel-good vibe, Trixie’s Aunt Stella and parents arrive to pitch in along with the gang at the Silver Bullet, cooking and decorating in grand fashion. And we actually get to meet the oft-mentioned but never before seen Bob, the mysterious Silver Bullet chef who’s been off traveling since the series began! Also, fittingly for a Christmas story, Trixie comes to realize how blessed she is, and her relationship with Ty definitely progresses by book’s end. The Comfort Food Mystery series will appeal to fans of cozies. The stories move along at a brisk pace and make for a pleasant read with humor and talk of food along the way. And over a dozen recipes are included at the back of this book. Many of them are for cookies perfect for the Christmas (and Christmas in July) season.